Flying into theaters soon, Disney has been working on a live-action remake of the classic story Dumbo, which releases on March 29, 2019! From Disney and visionary director Tim Burton, the all-new grand live-action adventure Dumbo expands on the beloved classic story where differences are celebrated, family is cherished and dreams take flight. Featured today on Theresa’s Reviews, check out 10 fun facts about the movie. Plus, you can claim tickets to the movie screening! FULL CIRCLE – Director Tim Burton studied animation at CalArts alongside a host of future Disney filmmakers, including Chris Buck (Frozen), John Musker (Moana), Mike Giaimo (Frozen), Glen Keane (Tangled) and Rich Moore (Ralph Breaks the Internet). Burton worked at Disney Animation in the early 1980s, and directed two shorts for the studio (Vincent and the live-action short Frankenweenie) and later wrote and produced the 1993 stop-motion cult phenomenon The Nightmare Before Christmas. Burton’s 2010 reimagining of Alice in Wonderland won Oscars® for best achievement in costume design (Colleen Atwood), and best achievement in art direction (Robert Stromberg, production designer, and Karen O’Hara, set decorator). 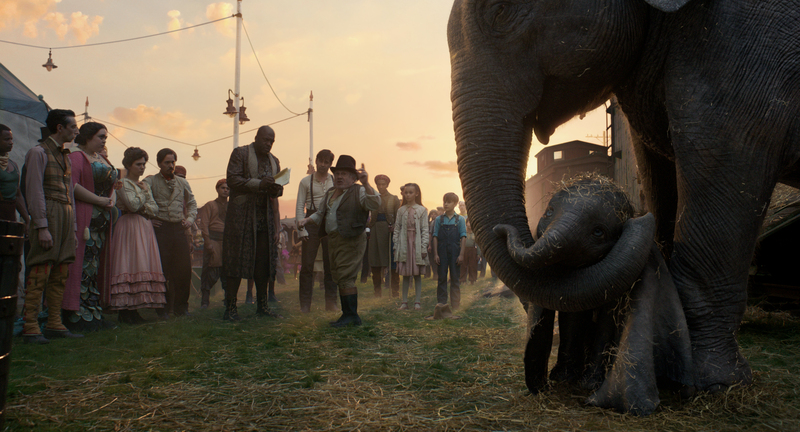 ANIMAL MAGIC — The live-action reimagining of Dumbo utilizes state-of-the-art visual effects to portray Dumbo and many of his four-legged counterparts. CHOO CHOO – Utilizing the design of the train in the animated film Dumbo, filmmakers behind the live-action reimagining constructed a full-scale Casey Jr. train for the film. However, since the Medici Bros. Circus is far from new and shiny, the train had to be aged with chipped paint and wear and tear to aptly reflect the state of the circus. SETTING UP CAMP – Dumbo was shot just outside London on soundstages at Pinewood Studios East, which made it the second film to shoot in the new section of the famous film lot. THE REAL DEAL – Filmmakers felt strongly about featuring real circus performers to infuse a sense of authenticity to their circus. Fourth-generation circus performer Kristian Kristof from Hungary was hired to share not only his extensive knowledge of the circus, but his international circus connections. The result was a multicultural array of performers, including jugglers, clowns, knife throwers, contortionists, a dog trainer and more. MOVIE MAGIC – Since Dumbo, Mrs. Jumbo and the other elephants in the film are added in post-production by the visual effects department, the production team had to build on-set stand-ins for fellow performers to act opposite. Lifelike replications were created in some cases to assist in lighting certain scenes. In other cases, crew members dressed in green, which made them easy to remove in post, and carried elephant-sized frames to demonstrate where the elephants would ultimately be placed. Green stuffies and elephant suits were also created to help establish eye-lines. 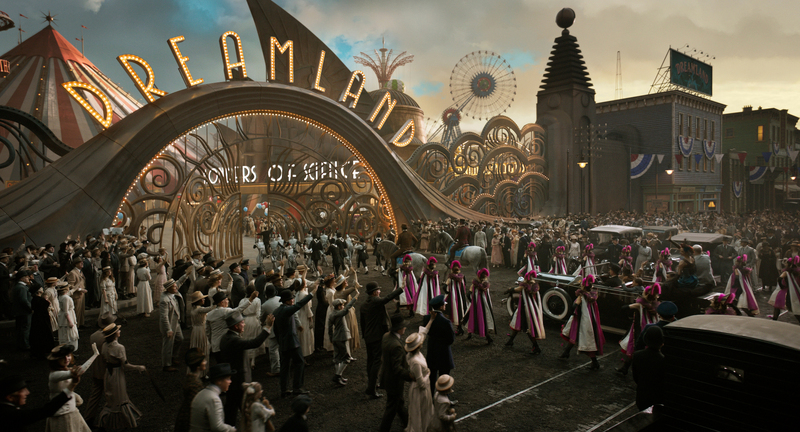 I LOVE A PARADE – For Dreamland’s parade sequence, costume designer Colleen Atwood’s team created more than 200 costumes for the performers, plus an additional 500 for the crowd characters. A LITTLE JIGGLE – The team behind the elephants’ animation pushed available technology to the next level, adding sliding skin, flexing muscles and jiggling fat to give the animals a sense of mass. ON YOUR TOES — To play the role of aerialist Colette Marchant, Eva Green had to exude not only the physique, but the fluidity such a performer would embody. Personal trainer and aerialist Francesca Jaynes was tapped to work with Green. One of the strategies employed to build strength and elegance was ballet. AIMING HIGH – Eva Green portrays aerialist Colette Marchant, but the actress joined the production with a serious fear of heights. A professional aerialist was hired to double for Green as needed, and worked with the actress to build her confidence in the air. In the end, Green conquered much of her fear and was able to perform a lot of the choreography. Claim tickets to go watch Dumbo before it releases in theaters! Visit www.seeitfirst.net and enter the code: 518014. This code is good for 5 X Family Four Packs to the AMC Mazza Gallerie 7 in Washington DC on Tuesday, March 26, 2019. For more entertainment news, follow Theresa’s Reviews on Facebook, Twitter, Instagram, Pinterest, and YouTube.